Four workable drawers for storing pens, pencils and notepads. The wood tower measures 8" x 8" x 14-1/2"H. Plan includes FULL SIZE drawings for all parts, as well as complete wiring instructions. Order hardware parts package or Special separately. The #1570 Shaker Drawer Lamp Hardware package includes the lamp socket, 8' clear cord, 10" lamp harp, 5" straight lamp pipe, check ring, lamp nuts and wood knobs. 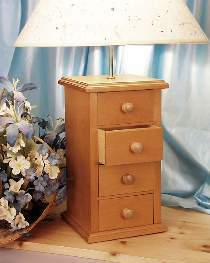 The #1571 Shaker Drawer Lamp Special includes both #2210 Plan and #1570 Hardware package. Project plan, wood and wood finish are not included. #1571 SHAKER DRAWER LAMP SPEC.